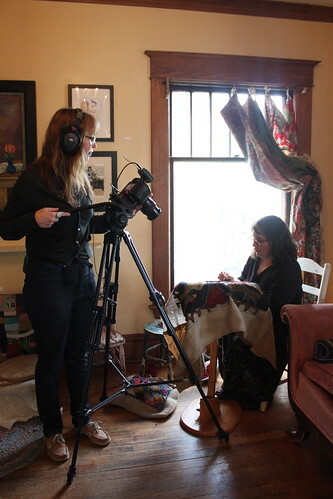 Tara from etsy films shoots Brenda Beerhorst, originally uploaded by roses&pearls. We are in the process of a short film being made by Etsy.com this week end that will end up posted to their website. Our new friend Tara Young has been patiently shooting for the past two days. She has interviewed all the children and Brenda and I. She has shot B roll and interacted with our guests. The children have done a pretty good job of taking the whole thing in stride. Fortunately they have all grown up be the subject of many a drawing, painting of photograph so they are good at acting natural in situations that are not normal like having a big heavy camera on a large tripod watching you while you play video games, draw with crayons, or feed the chickens. Tara is a story teller and she tells her stories through video. She is here for our story and we are doing the best we can to accommodate her because we feel like this is a rare opportunity to share a Beerhorst Family Art Show with the world outside of Grand Rapids Michigan. We would hope this may unlock ideas other families may have to work together. Perhaps other families would like to find reasons to open their homes to their neighborhoods doing commerce and making new friends at the same time.